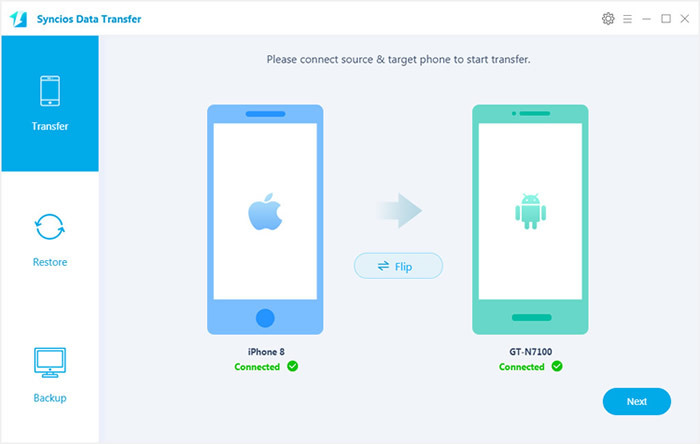 Syncios Data Transfer provides simply yet effective phone to phone transfer solution for transferring contacts, music, video, SMS, call logs, photos, etc between Android & iOS. You can also backup phone data to PC and restore in a few clicks. 100% Safe and Risk-free! Here we take these two devices for example. The names of your devices will be displayed on the screen. Please noticed that your Source device must on the left side and your Target device must on the right side. You can click 'Flip' to change which one be the source and the targeted device. Note: If you have Android device to be connected, it's required to enable USB debugging mode and install driver. 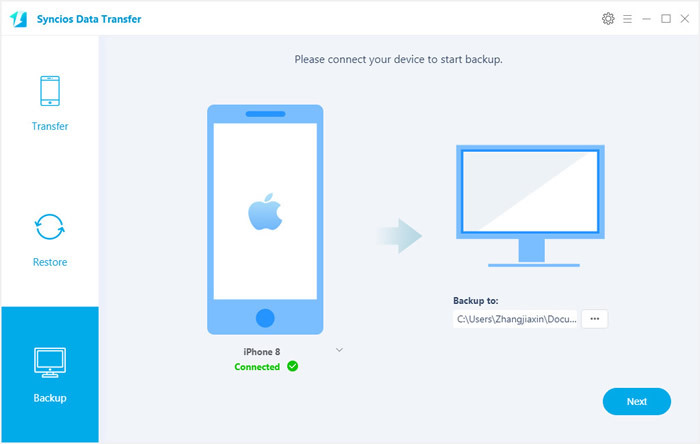 Click here to learn how to enable USB Debugging Mode >> Also, if your iOS device encounter any detection problem, please click here to fix. After you connected two devices successfully, please click on "Next" button. Data on your source phone that can be transferred are listed on the screen. Now, you are allowed to select your desired data to transfer. Check those you wish to transfer or select all, wait for loading completed, click on "Next" to start transfer process. The selected files would be fully copied to your target phone. Firstly, run Syncios Data Transfer and select "Backup" mode on the main interface. Connect your device to computer with an USB cable, customize the backup folder if you want, and then click on "Next" button. And now, you are allowed to select your desired data to transfer. Check those you wish to transfer or select all, wait for loading completed, click on "Next" to start transfer process. After a while, all selected contents will be backed up to the computer. Please select 'Restore' mode on the main interface while your phone is connected to the computer. 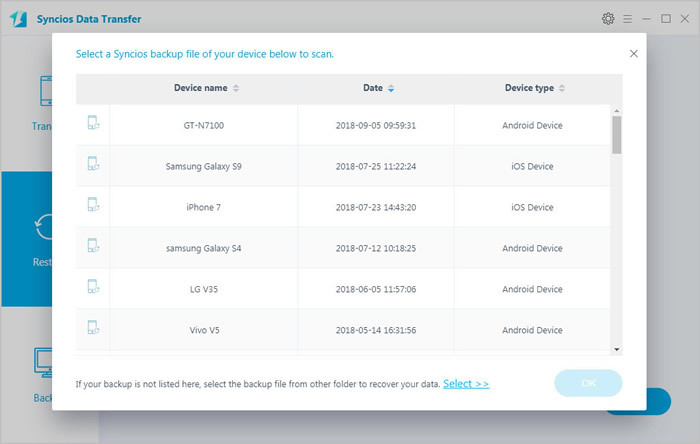 Select 'Syncios Backup' option and all backups you made before will list on the interface. Choose the certain one and click 'OK' to continue. Then click 'Next' to select your desired data to transfer. Check those you wish to transfer or select all, wait for loading completed, click on "Next" to start transfer process. 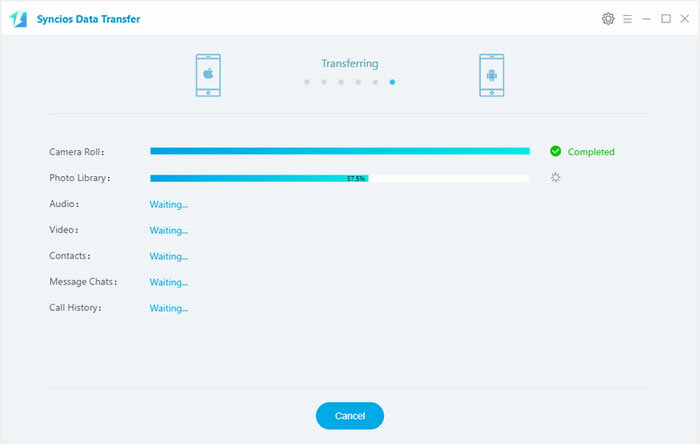 Now, SynciOS Data Transfer also empowers you to transfer iTunes playlists to your Android phone as well as iDevice effortlessly. 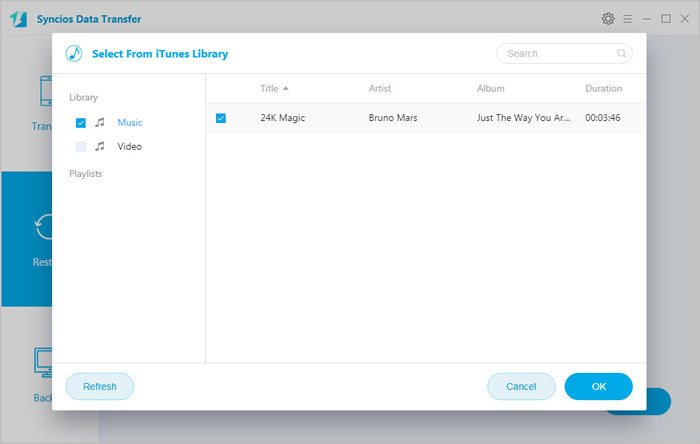 Similarly, run Syncios Data Transfer and select "Restore" mode on the main interface, click on "iTunes Library" button, Syncios Data Transfer will list out your iTunes library on the middle of the panel. Simply select your desired ones to transfer to your device. 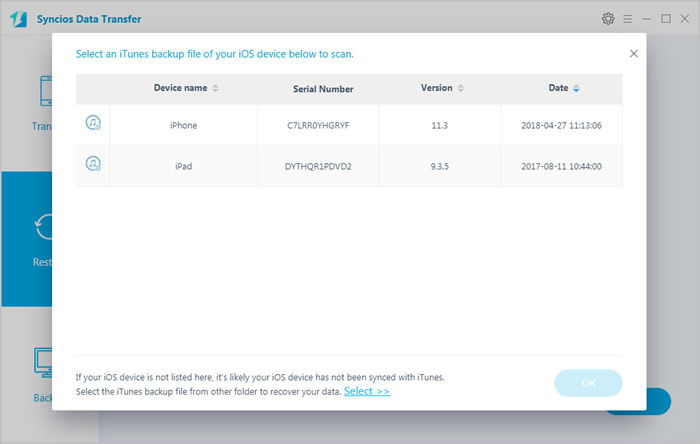 If you have ever backed up your iPad/iPhone/iPod through iTunes, you can recover lost contacts, photos, videos, SMS messages, notes, ebooks and settings from iTunes backup files in your computer.